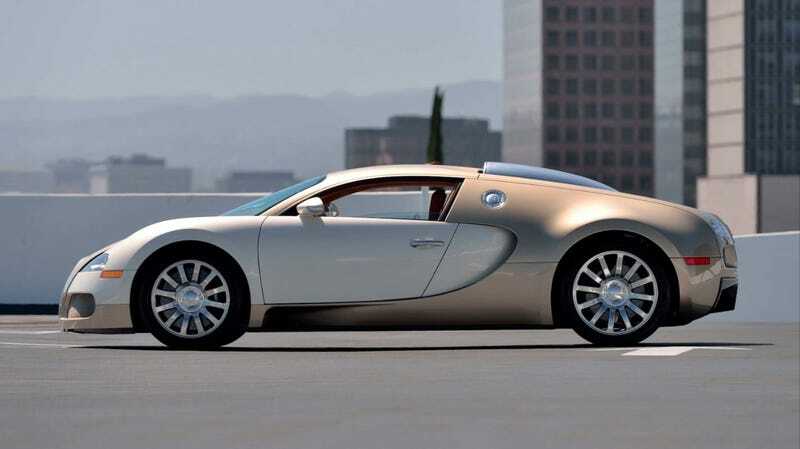 A 2008 Bugatti Veyron 16.4 that went to auction with Mecum in August and sold for $950,000. It supposedly costs about $20,000 to change the oil in a Bugatti Veyron, which admittedly looks like a big enough pain to warrant that much. But that’s also the day price to rent Bugatti’s aging but still terrifyingly powerful supercar, in case you had some loose change and weren’t sure how to use it. It’s only about $1,000 an hour, after all. Total steal. A day rental on a Veyron usually costs between $20,000 and $25,000, or a few bucks short of the list price for the average used Lotus Elise (a lasting deal! ), according to a recent story from CNBC. That little fun fact came from Las Vegas rental company Royalty Exotic Cars, which gets a lot of attention on the internet for its videos on how tedious it is to do routine maintenance, like an oil change, on supercars like the Veyron, a Lamborghini Huracan and a Ferrari 488. Royalty CEO Houston Crosta told CNBC Royalty’s 1,200-horsepower Veyron, which has a $1 million Mansory Edition upgrade, is so expensive to rent because it’s rare and “depreciates at almost $1,500 per mile.” That’s almost impossible to verify because Royalty’s modified car is the only one of its kind, but Royalty’s website lists it at a rate of $15,000 for four hours, $20,000 for eight hours and $30,000 for 24 hours. Again, that’s the average sale price of a used Lotus Elise. The less pretty side of Royalty’s Bugatti Mansory Edition, as the shop gives it a complex oil change. But mileage depreciation probably isn’t too big of a deal for Veyron rentals. In one of those realizations that seems mind boggling at first but turns into an “Oh, duh,” moment soon afterward, CNBC reports that a representative from the MPH Club rental hub in Miami said a lot of people don’t rent Veyrons to drive them. They rent the cars for things like shoots instead. The MPH Club representative told CNBC a person renting a Veyron has to put down a security deposit of $150,000 to $250,000, and Royalty said it doesn’t just let someone walk in with $20,000 and walk out with the car. So, yeah, next time you’ve got some spare change to drop on a Veyron rental, remember that you need enough in the bank to cover it in case you smash all several million dollars of it into a wall. No sweat.